This products is currently not available. 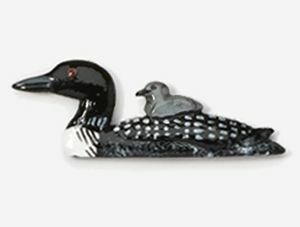 Loon with Chick pin cast in lead-free Fine Pewter. Hand Painted by award winning artist Michele Kortbawi-Wilk. Painted with acrylic and protected with a durable, multi-coat gloss for everyday wear. Each pin has two short nails and two flat-backed clutches for a secure, non-spin hold. Measure: 1.8" long X .6" tall. Handcrafted in the USA.